Israeli Prime Minister Benjamin Netanyahu would not commit to a two-state solution to Israel's ongoing conflict with Palestinians in an interview with CNN, despite President Donald Trump indicating, at least for a time, that would be his preferred outcome. Asked by CNN's Elise Labott whether he was ready to reaffirm his commitment to a two-state solution, the Israeli leader said, "I've discovered that, if you use labels, you're not going to get very far because different people mean different things when they say 'states.' So rather than talk about labels, I'd like to talk about substance." Trump broke with precedent early in his presidency by backing off the United States' firm support for a two-state solution, indicating that he was ambivalent about whether the conflict should be solved by a one- or two-state solution. But Wednesday, Trump voiced support for a two-state solution to the conflict, saying he believes that solution "works best." "I like two-state solution. I like two-state solution" Trump said. "That's what I think works best. I don't even have to speak to anybody, that's my feeling." When pressed about the change at a news conference later that day, the President said that while he believed "the two-state will happen," he reverted to his prior stance. "If the Israelis and the Palestinians want one state, that's OK with me. If they want two-state, that's OK with me. I'm happy if they're happy," he said. Netanyahu said that in a one-on-one meeting with Trump on the margins of the United Nations General Assembly, the US President asked him, "what would you like to see?" 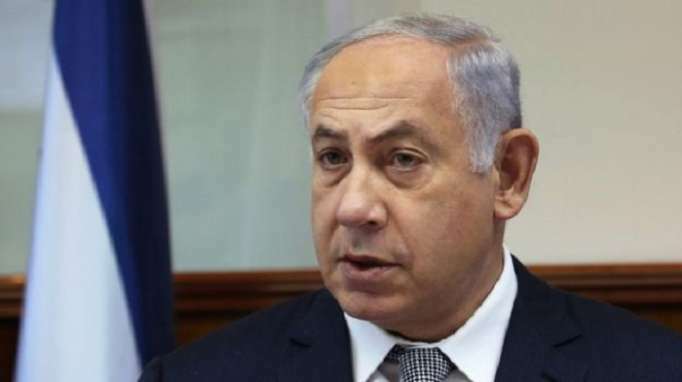 Netanyahu said he answered that he would like to see the Palestinians be self governing in a demilitarized state with "none of the powers to threaten us." "Israel has to have the overriding security, not the UN, not Canadian Mounties, not -- I don't know -- Austrian or Australian forces -- Israeli forces have to have the security control, otherwise, that place will be taken over by Islamist terrorists, either Daesh, ISIS or Hamas or Iran, all of the above," Netanyahu said. "And that's my condition." "People say, 'Was that commensurate with a state?' " Netanyahu asked. "I don't know, you decide. ... I want the Palestinians to govern themselves, but not to be able to threaten us." Netanyahu indicated that he hadn't yet seen the Mideast peace plan the administration is putting together, under the President's son-in-law and senior adviser, Jared Kushner, a family friend of the Israeli leader's. Netanyahu said he is "certainly going to look at it and look at it with a -- with a keen and open mind, because I know there's great friendship to Israel." "The question of what happens, you know, precisely, when he puts it out depends on -- I'll look at it," Netanyahu said. "In fact, I was -- you know, I always said that I'm willing to look at peace proposals put forward by the United States."